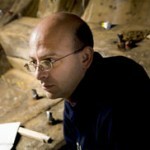 Kroum Batchvarov is Associate Professor of Maritime Archaeology at the University of Connecticut, and holds his degrees from Park College and Texas A&M University (MA and PhD). He has a number of ongoing projects, including the Black Sea Maritime Archaeology Project (as Co-Principal Investigator), the Rockley Bay Research Project in Tobago (as Project Director and Principal Investigator), and the Vasa project (analysis of construction and documentation of a 17th century Dutch-built man-of-war); he also served as Co-Principal Investigator for the Ropotamo inundated Chalcolithic settlement excavation (part of teh Black Sea Maritime Archaeology Project). His publications include Domestic Economy aboard a Black Sea merchantman (in press), and A Method for Documenting Hidden Structures on Shipwrecks (in review).